A new Aluroll survey has revealed a clear divide on opinions of home automation. Out of 1,000 respondents, 36% said they are in favour of connecting everyday devices to the internet, 31% were ‘confused’ by the new technology, and 29% were ‘left cold’ by it. Answers in the ‘other’ category included one person who liked the idea but was concerned about security, somebody who said it depended on the device, and another who was worried that it meant people were getting lazier. Perhaps unsurprisingly, these numbers were heavily influenced by age. 18 to 24 year-olds were the most positive about the technological advancements, with 59% of people choosing ‘excited’ as their answer. As the age range increased, the likelihood of them opting for this response decreased. Our oldest participants were most likely to be ‘left cold’. 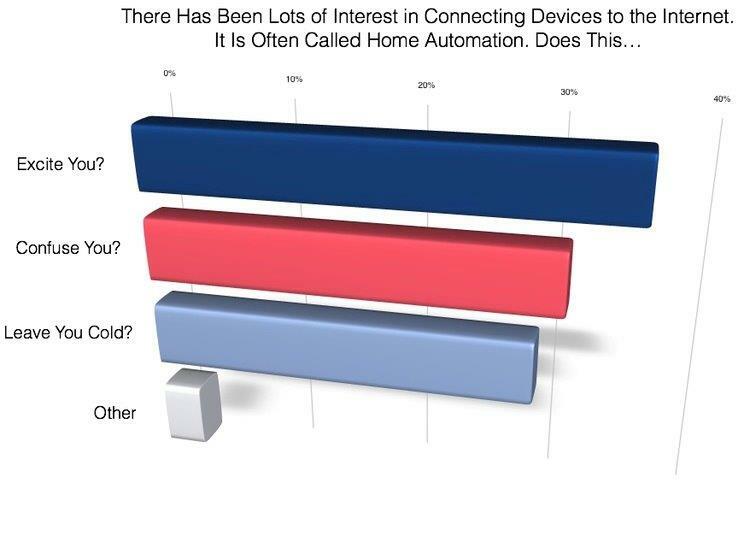 Women were less excited than men, and more confused about what the home automation actually is. Between 2010 and 2014 the home automation market saw a growth of 83%, and the overall value is forecast to double by 2019. While our survey revealed a mix of opinions, it is widely accepted that the technology is moving from an upper niche market audience to a more mainstream one. Technological advancements are driving this growth, and Google announced the launch of its own operating system Brillo this year. In 2014 the search giant acquired Nest, a company which started manufacturing Wi-Fi enabled thermostats and has recently moved into fire alarms and security cameras. When lights, heating, locks and appliances can all be controlled from a single central system and a smartphone, there are a wide range of potential applications. The idea is that you’ll be able to walk into a room and the perfect ambiance lighting will spring into action, or turn the heating on as you’re on your way home from work. Apps have made the systems more user friendly, while modular systems provide the opportunity to expand it as you buy new technology. In terms of security, home automation will have a huge impact on how we protect our property. It may become a common occurrence to check any activity your CCTV cameras have picked up while you’re away on holiday, make sure you locked the back door while you’re in town, or even unlock and open your garage for a gardener’s arrival while you’re at work. What do you think of home automation? Leave a comment at this link to let Aluroll know your thoughts.